The United States Congress designated the Desolation Wilderness (map) in 1969 and it now has a total of 64,041 acres. All of this wilderness is located in California and is managed by the Forest Service. The Desolation Wilderness, encompassing 63,475 acres of rugged alpine terrain, is a spectacular area of subalpine and alpine forests, jagged granitic peaks, and glacially formed valleys and lake basins. Here on both sides of the Sierra Nevada, averaging 12.5 miles in length and 8 miles in width, you'll find elevations ranging from about 6,500 feet to almost 10,000 feet. Mostly lacking in dense vegetation, Desolation is a glacially smoothed expanse west of Lake Tahoe. . You'll discover numerous streams and approximately 130 lakes, some reaching 900 acres in size. Snow often blocks the high passes until mid-July. Long recognized for its mountain splendor, Desolation Valley Primitive Area was established in 1931 and then granted Wilderness status in 1969. 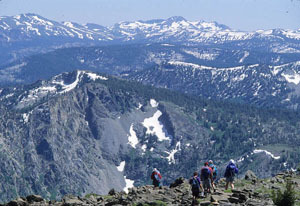 The Pacific Crest Trail traverses about 17 miles of the Wilderness north-south, and at one point crosses Dicks Pass (9,380 feet), the highest pass between here and Canada. 13 named trailheads open onto miles of well-maintained and well-trampled pathways. The trailheads at Wrights, Echo, Eagle Falls, and Fallen Leaf receive the heaviest use. The northwest portion of the area is less frequented and requires some map-reading or GPS skills to explore. Because of its beauty and accessibility, and close proximity to major metropolitan areas, the Desolation is one of the most visited wildernesses for its size in the country. Permits are required for day and overnight use. Day users can self-register at the trailheads. Overnight users can obtain their permit online by accessing the "recreation.gov" website, or can also obtain their permit from a Forest Service office because of an overnight quota system and a fee. 75% of overnight permits are available by advanced reservation, otherwise it is first-come, first-served the day of your trip. Campfires are prohibited everywhere in Desolation, so be sure to bring a portable camp stove. Planning to Visit the Desolation Wilderness? How to follow the seven standard Leave No Trace principles differs in different parts of the country (desert vs. Rocky Mountains). Click on any of the principles listed below to learn more about how they apply in the Desolation Wilderness.